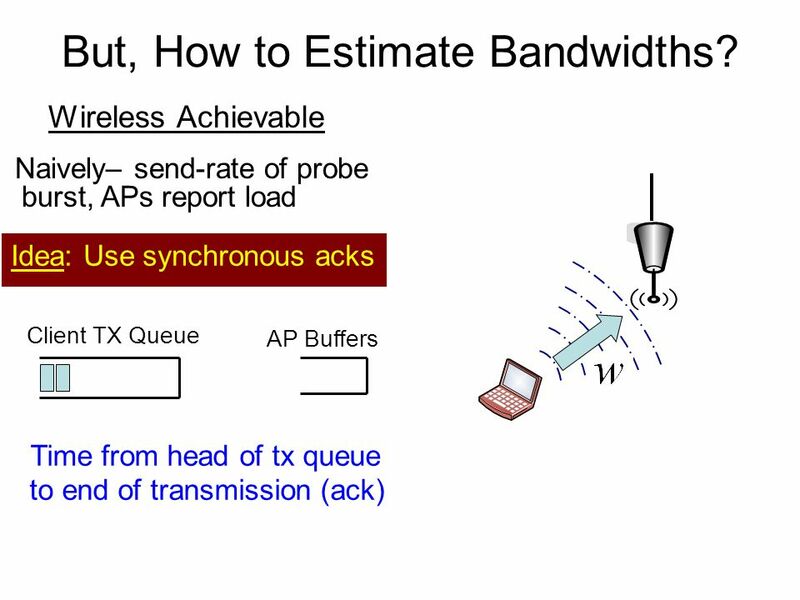 Problem 1: AP Uplink ~ 2Mbps (DSL/Cable Modems) Wireless Link ~ 54Mbps (Theoretical Max) 2+2+2+… Uplink Bottleneck Can Aggregate Bandwidth from nearby APs! 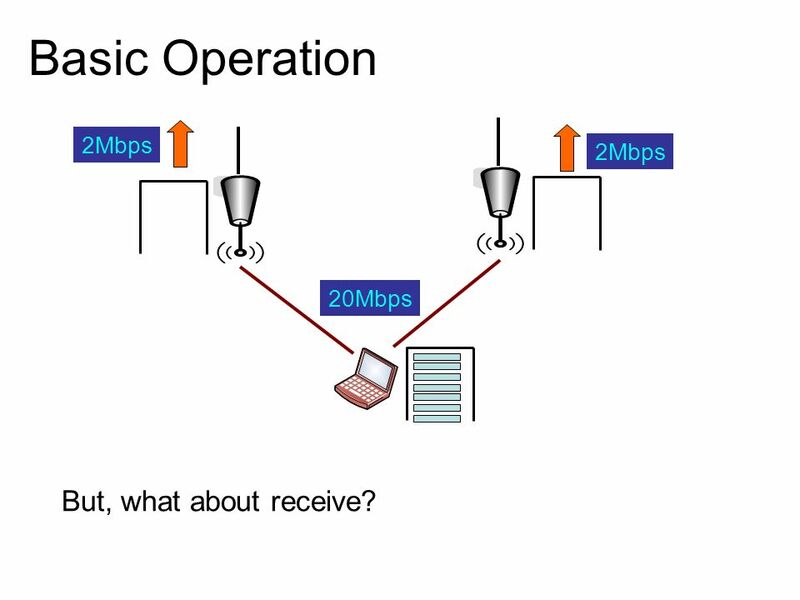 7 Basic Operation 2Mbps 2Mbps 20Mbps But, what about receive? 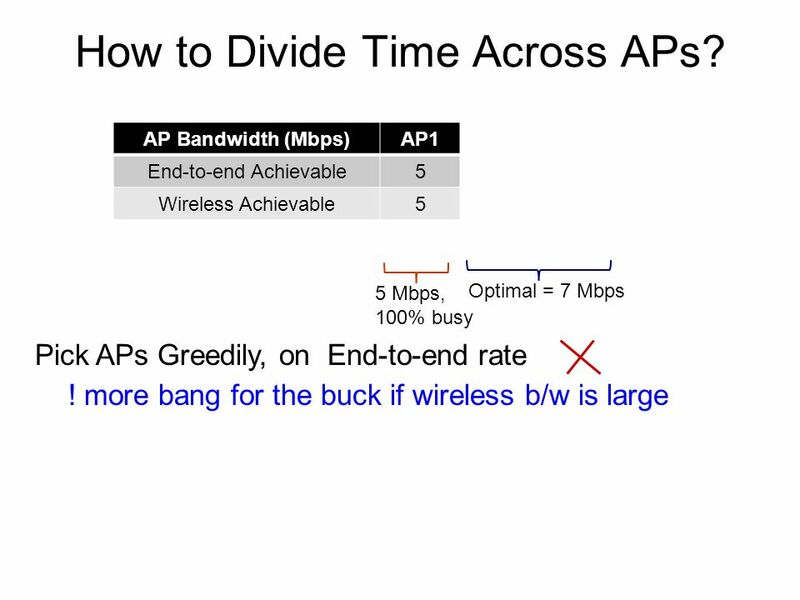 11 How much time to spend at an AP? 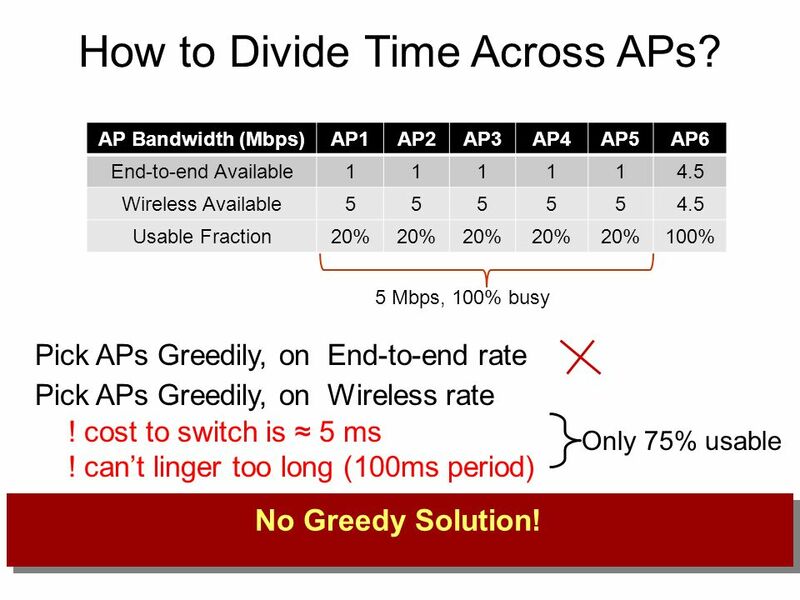 12 How to Divide Time Across APs? 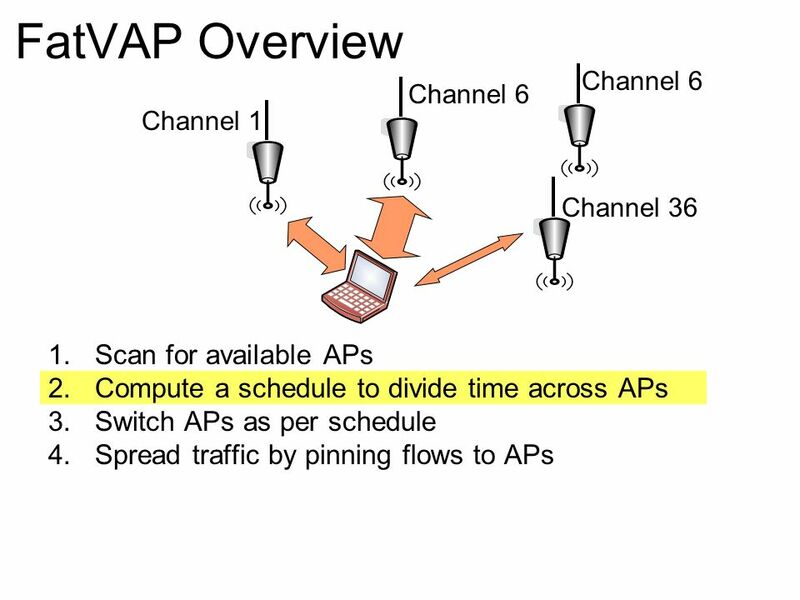 13 How to Divide Time Across APs? 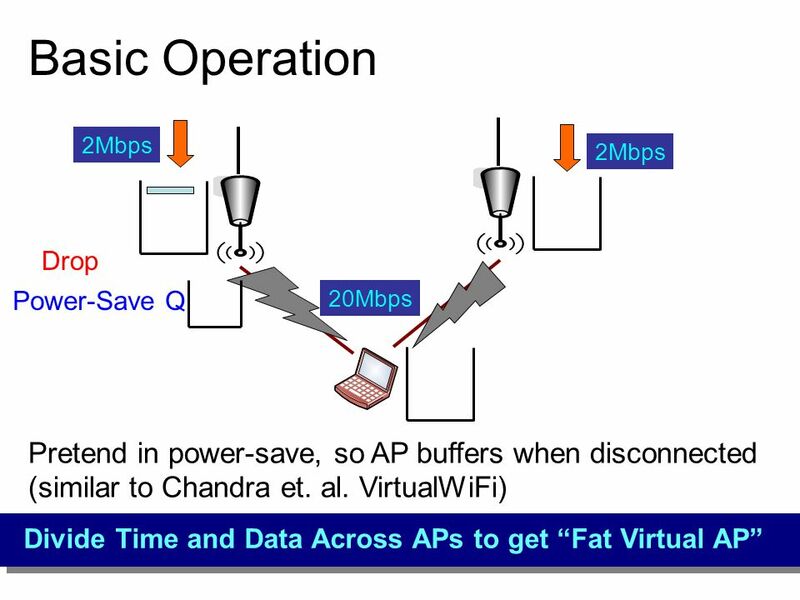 AP Bandwidth (Mbps) AP1 AP2 AP3 AP4 AP5 AP6 End-to-end Available 1 4.5 Wireless Available 5 Usable Fraction 20% 100% 5 Mbps, 100% busy Pick APs Greedily, on End-to-end rate Pick APs Greedily, on Wireless rate ! 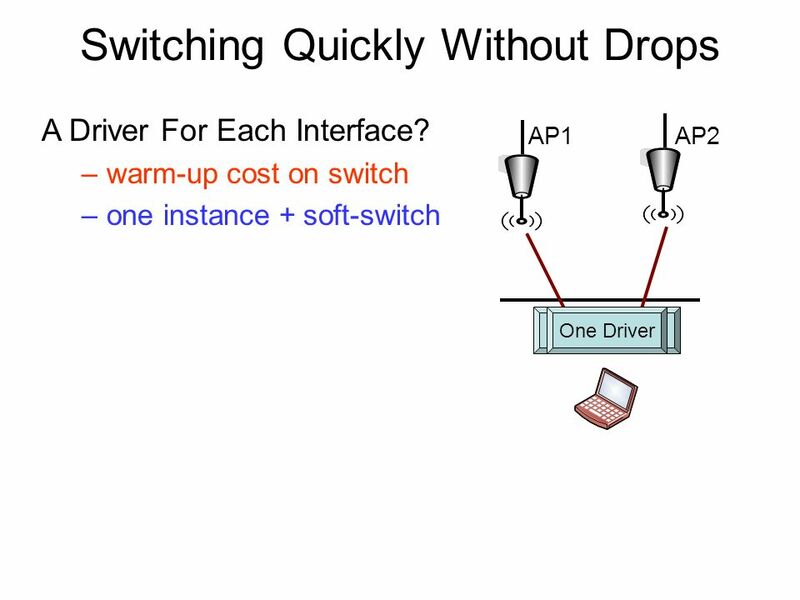 cost to switch is ≈ 5 ms ! 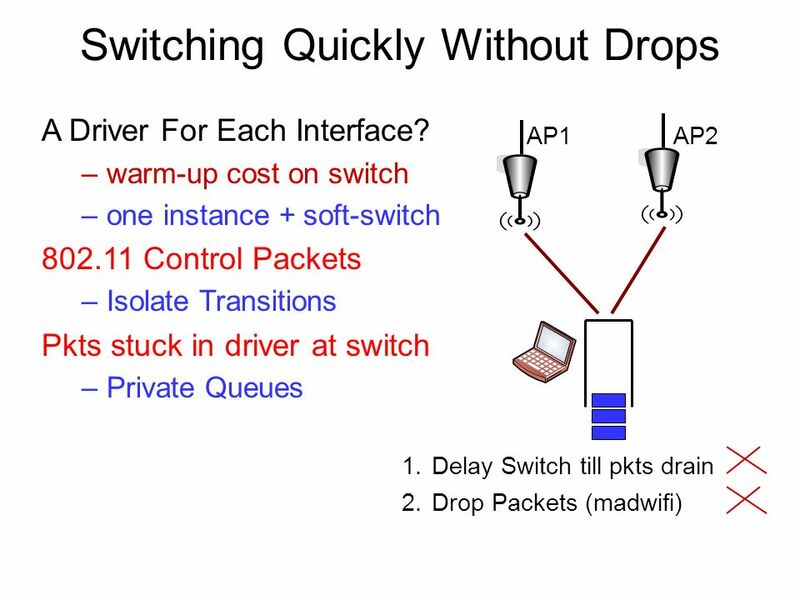 can’t linger too long (100ms period) Only 75% usable No Greedy Solution! 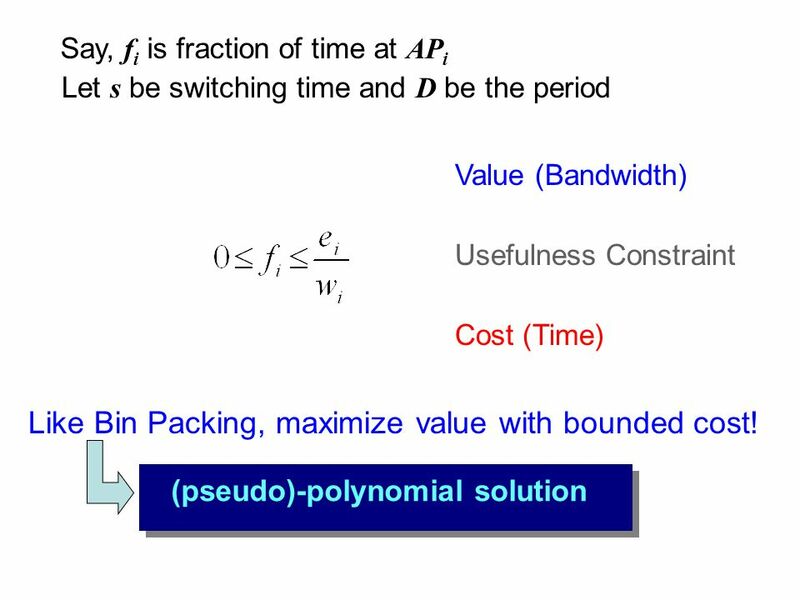 14 Like Bin Packing, maximize value with bounded cost! 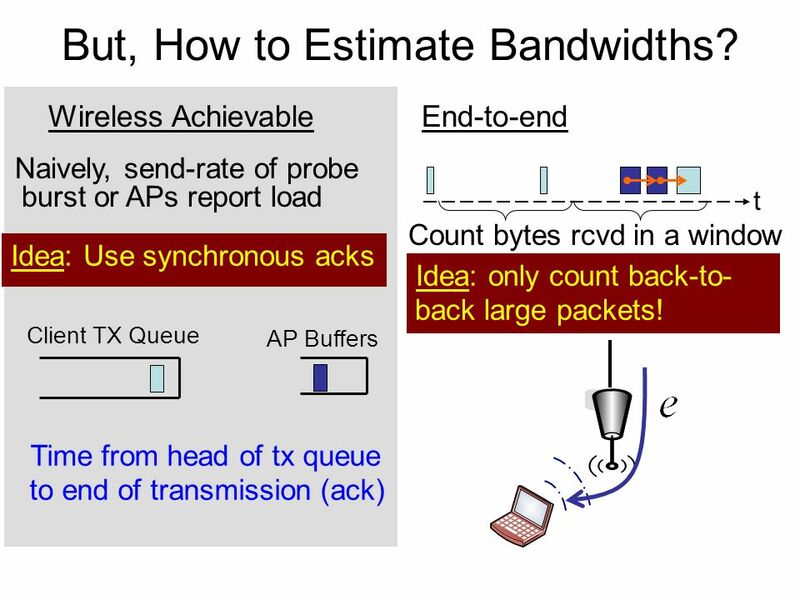 15 But, How to Estimate Bandwidths? 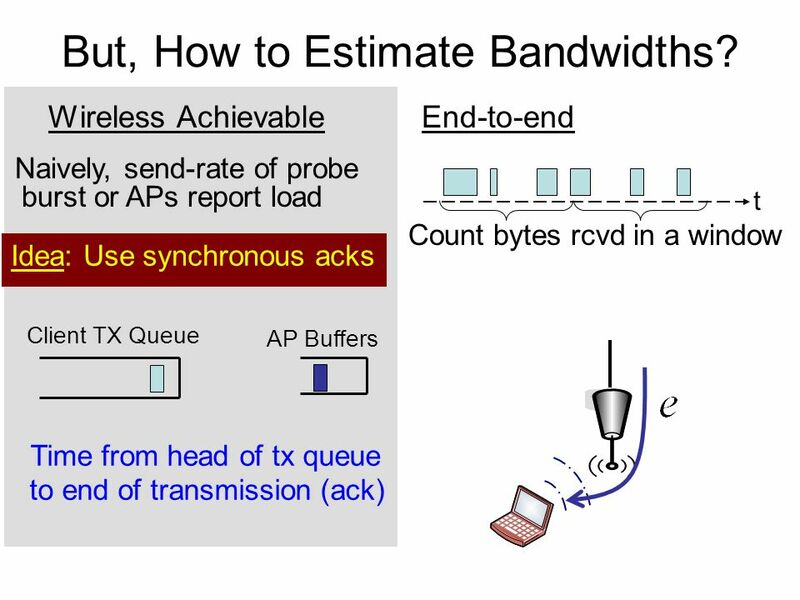 16 But, How to Estimate Bandwidths? 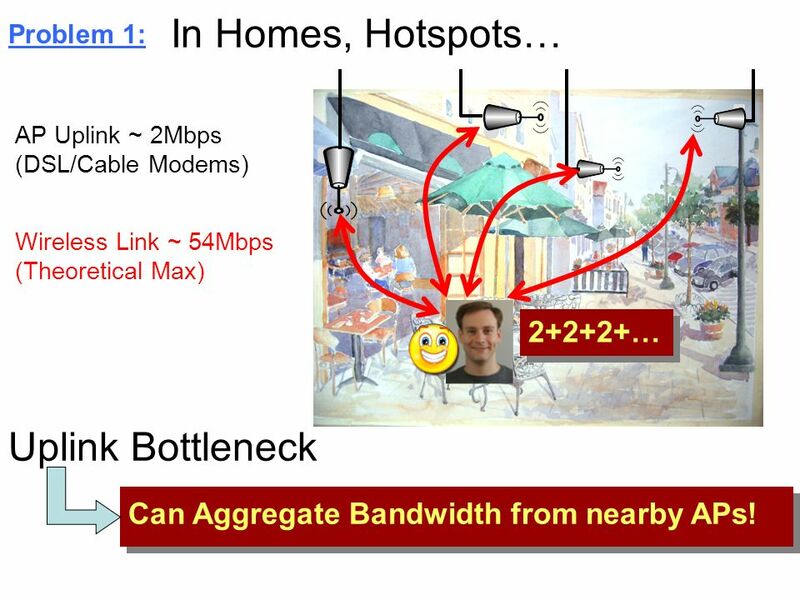 17 But, How to Estimate Bandwidths? 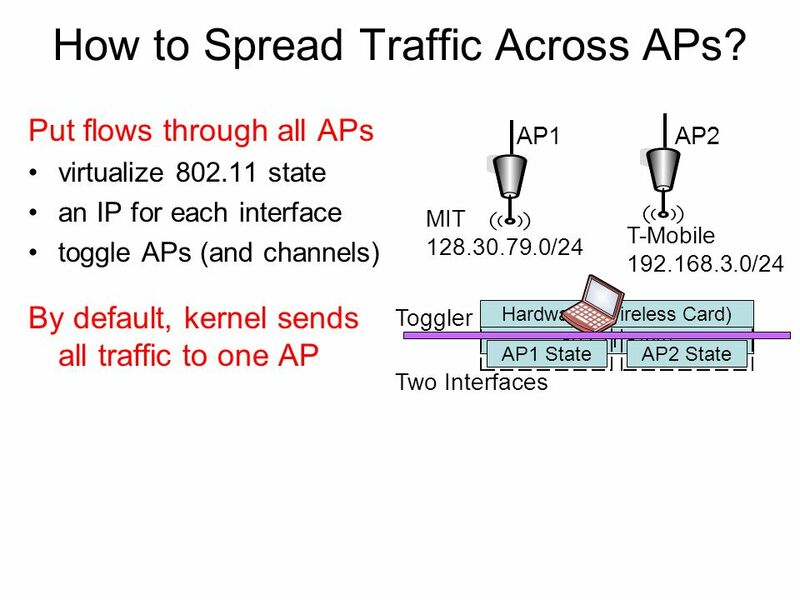 18 How to Spread Traffic Across APs? 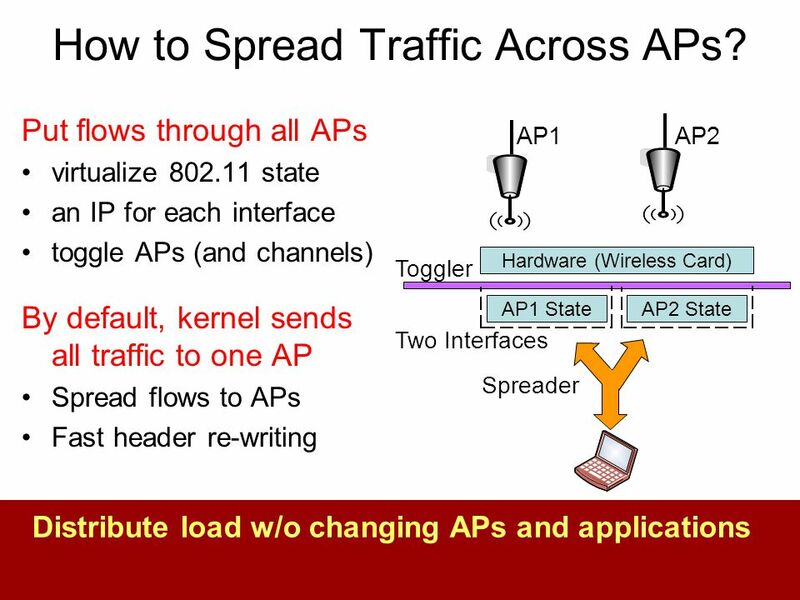 19 How to Spread Traffic Across APs? 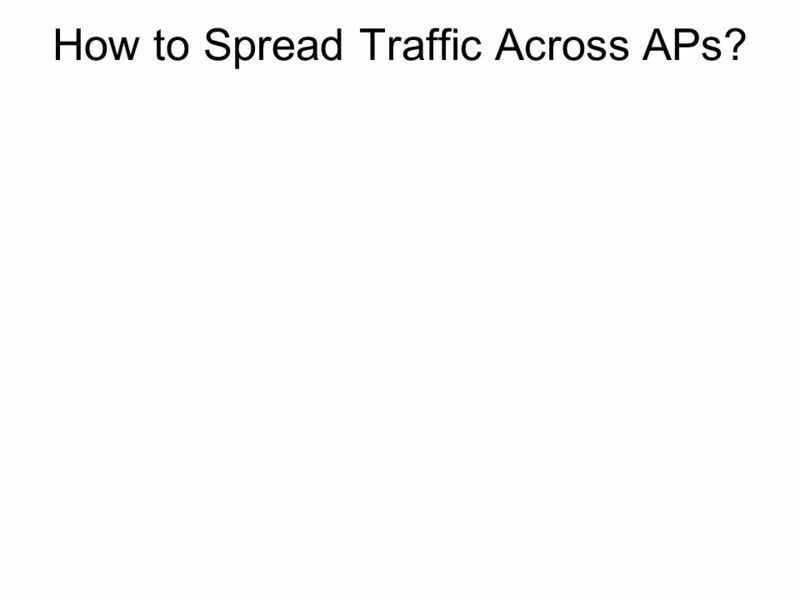 20 How to Spread Traffic Across APs? 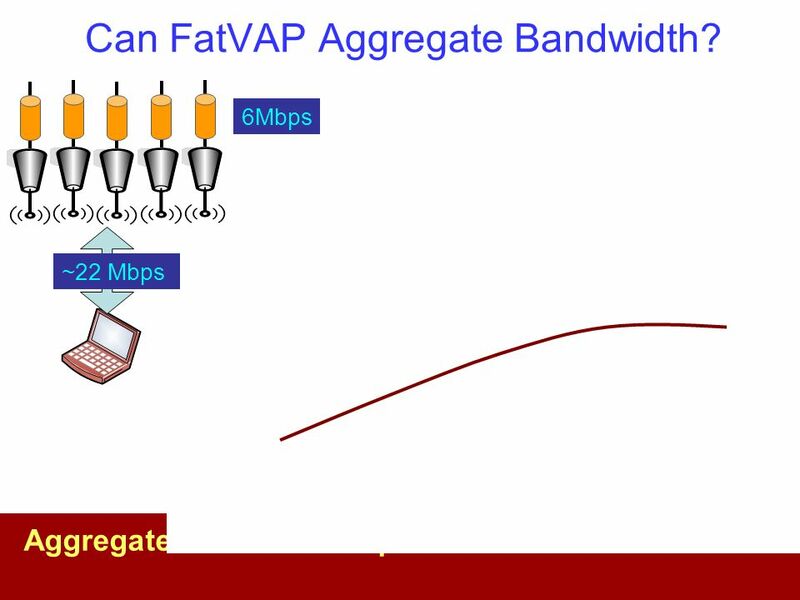 29 Can FatVAP Aggregate Bandwidth? 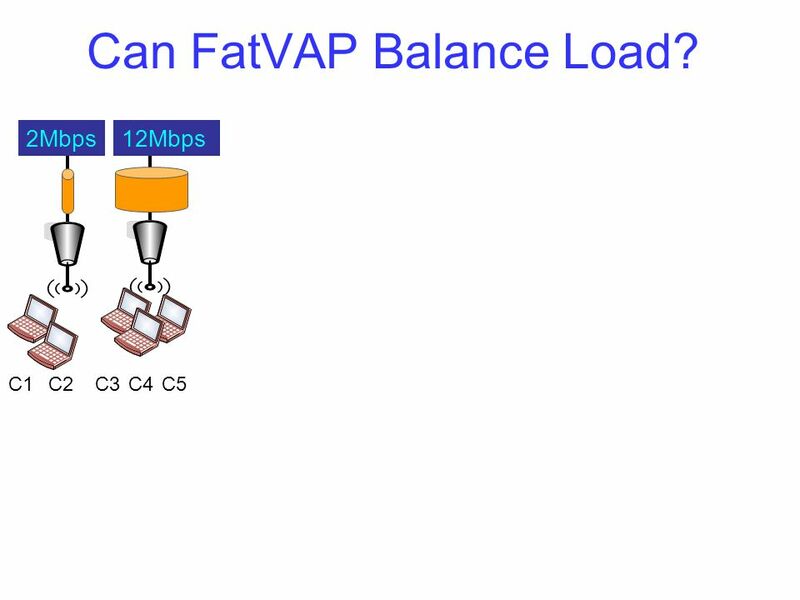 30 Can FatVAP Balance Load? 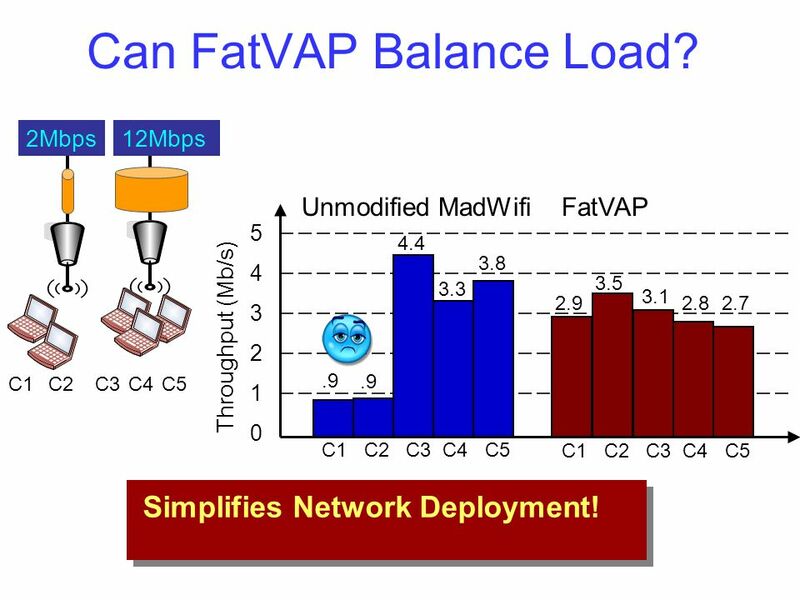 31 Can FatVAP Balance Load? 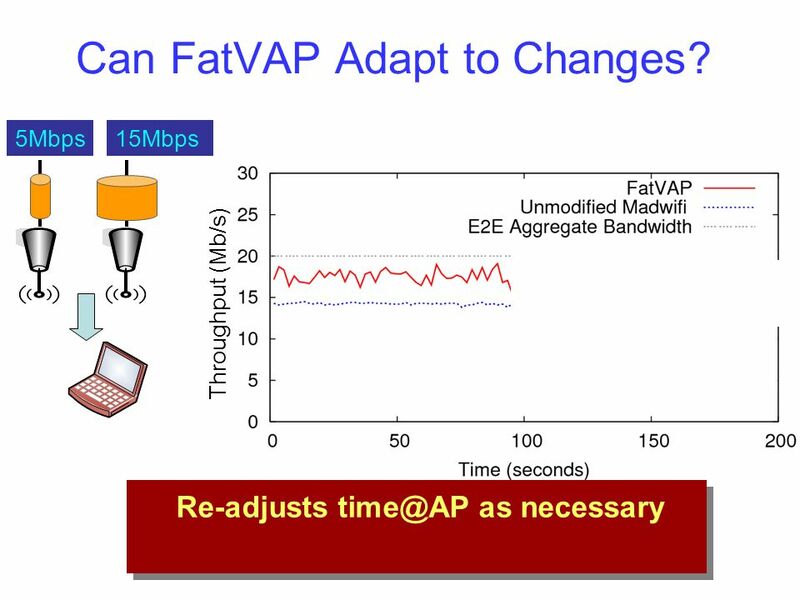 2Mbps 12Mbps Unmodified MadWifi FatVAP 5 4 3 2 1 4.4 3.8 3.5 3.3 3.1 2.9 2.8 2.7 Throughput (Mb/s) C1 C2 C3 C4 C5 .9 .9 Need not worry about putting more APs where there may be more users, or worry about assigning different channel widths to users… C1 C2 C3 C4 C5 C1 C2 C3 C4 C5 Simplifies Network Deployment! 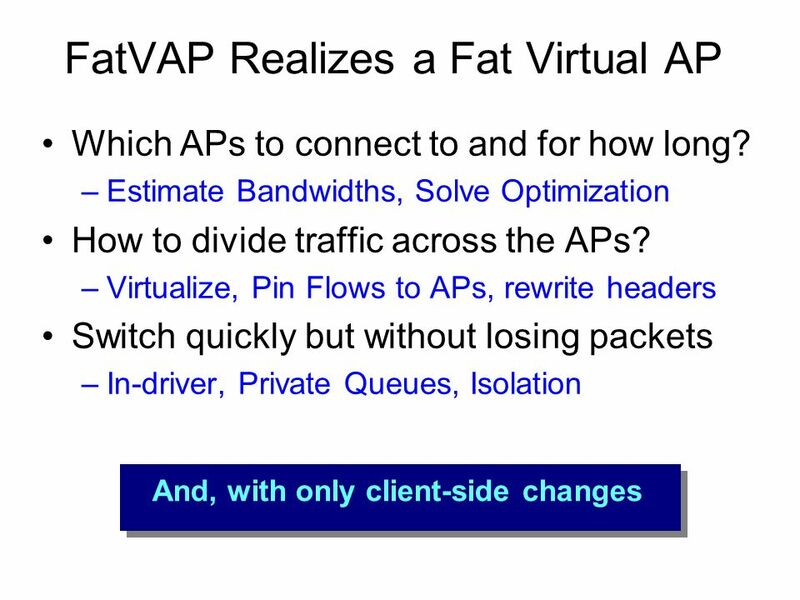 32 Can FatVAP Adapt to Changes? 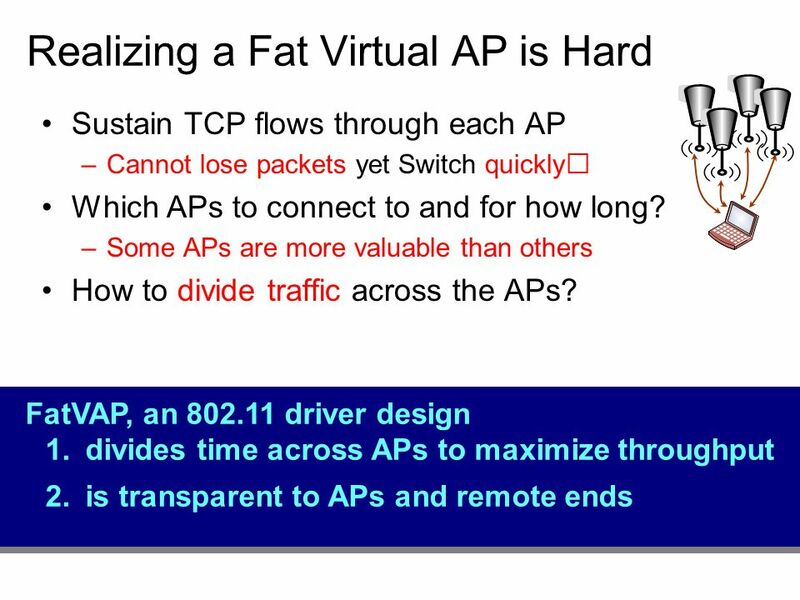 Download ppt "Fat Virtual Access Points"
1 EE384Y: Packet Switch Architectures Part II Load-balanced Switch (Borrowed from Isaac Keslassys Defense Talk) Nick McKeown Professor of Electrical Engineering. 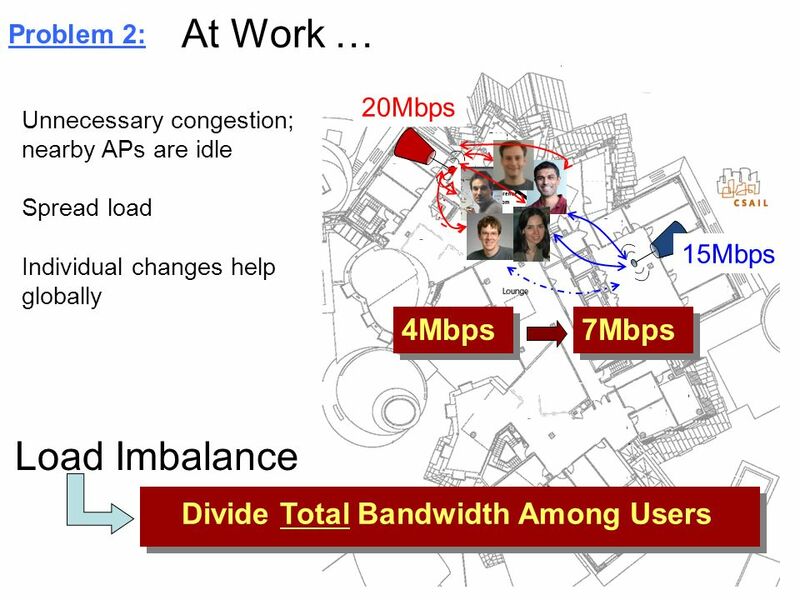 1 Routing in Multi-Radio, Multi-Hop Wireless Mesh Networks Richard Draves, Jitendra Padhye, and Brian Zill Microsoft Research. 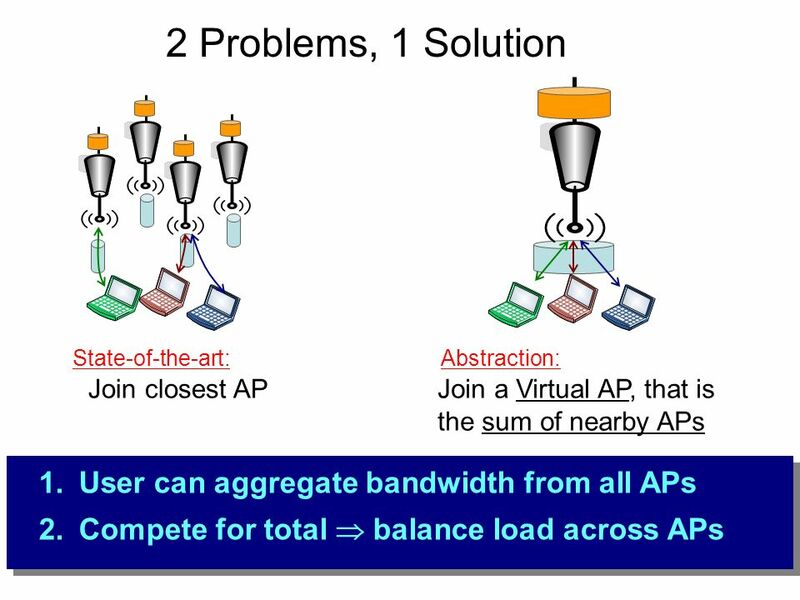 MultiNet: Connecting to Multiple IEEE Networks Using a Single Radio Ranveer Chandra, Cornell University joint work with: Victor Bahl (MSR) and Pradeep. 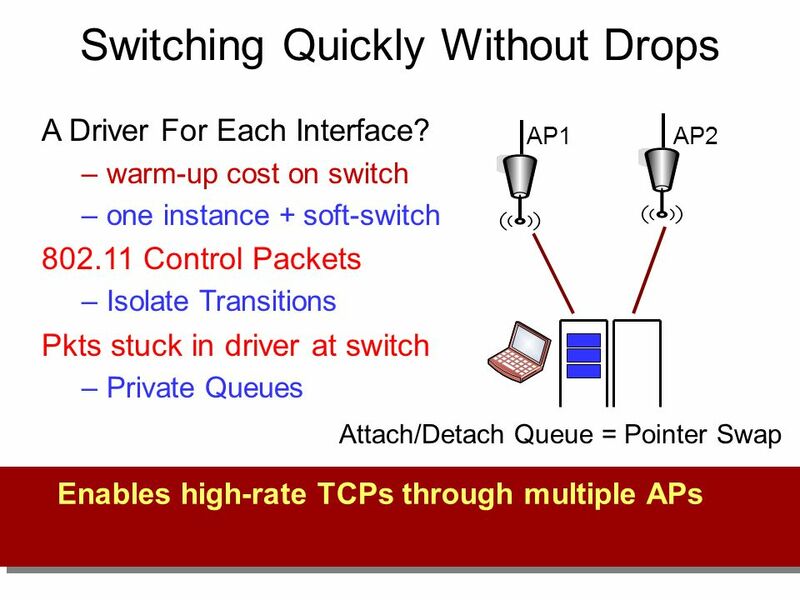 Multicast congestion control on many-to- many videoconferencing Xuan Zhang Network Research Center Tsinghua University, China. 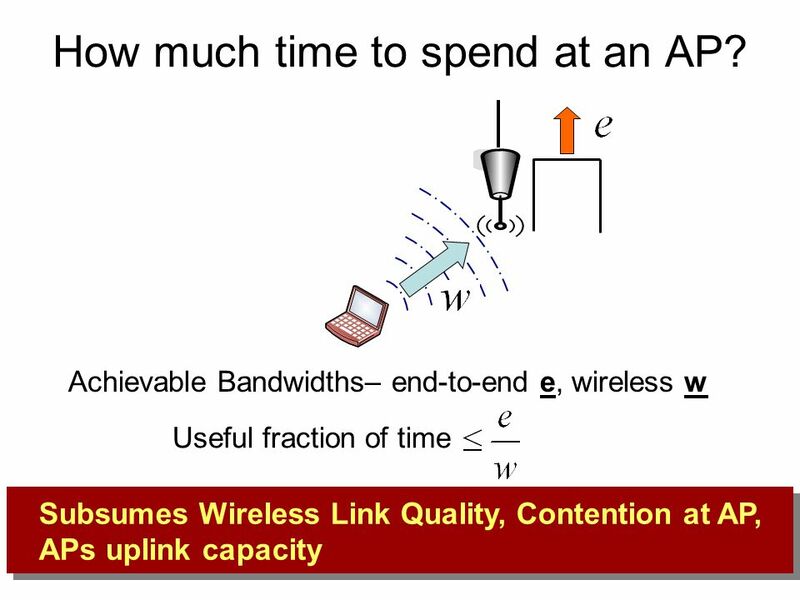 Wireless Networks Should Spread Spectrum On Demand Ramki Gummadi (MIT) Joint work with Hari Balakrishnan. 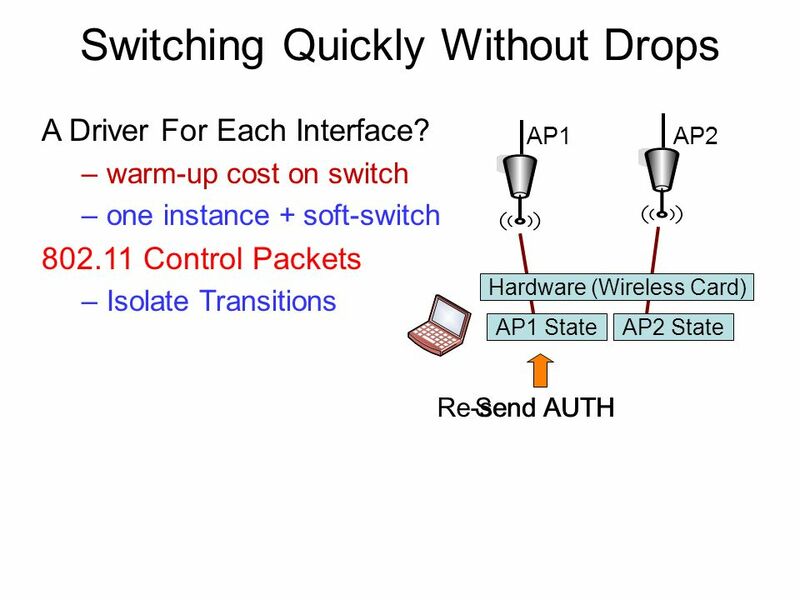 A Switch-Based Approach to Starvation in Data Centers Alex Shpiner and Isaac Keslassy Department of Electrical Engineering, Technion. 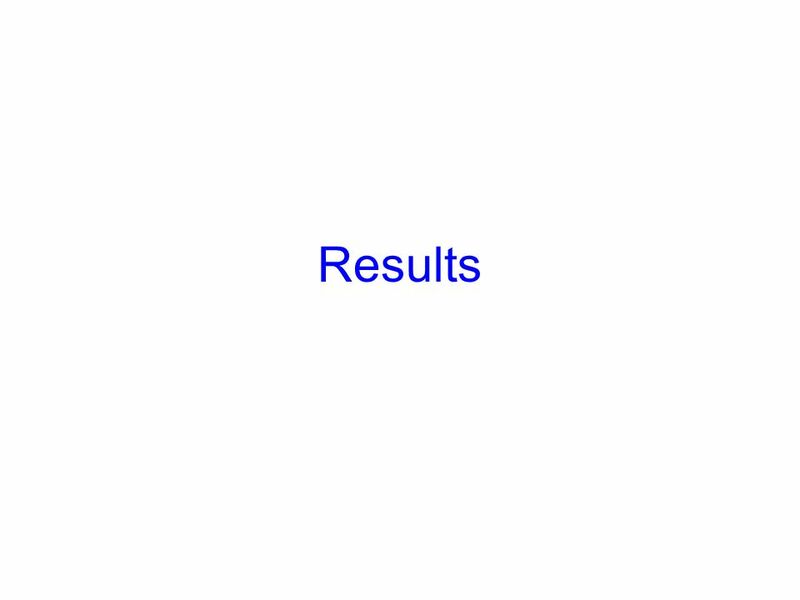 Gabi Bracha, Eyal. 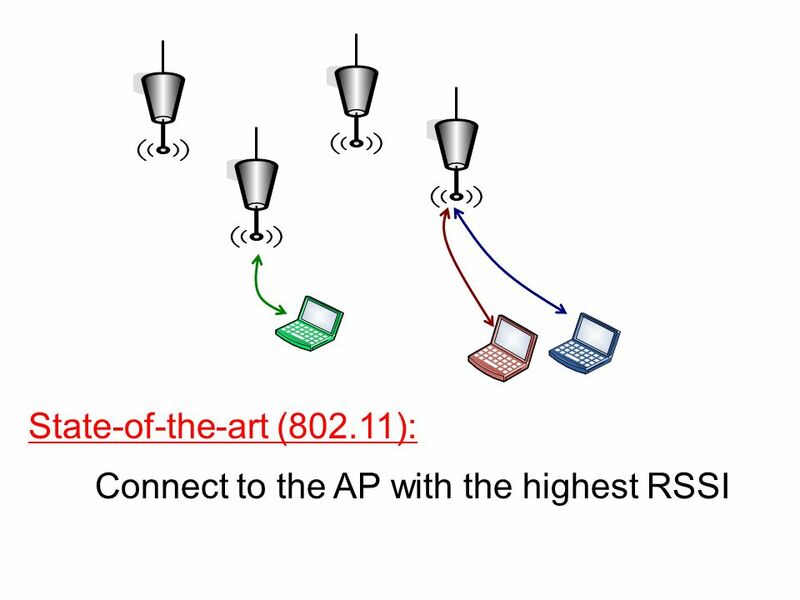 IEEE INFOCOM 2004 MultiNet: Connecting to Multiple IEEE Networks Using a Single Wireless Card. 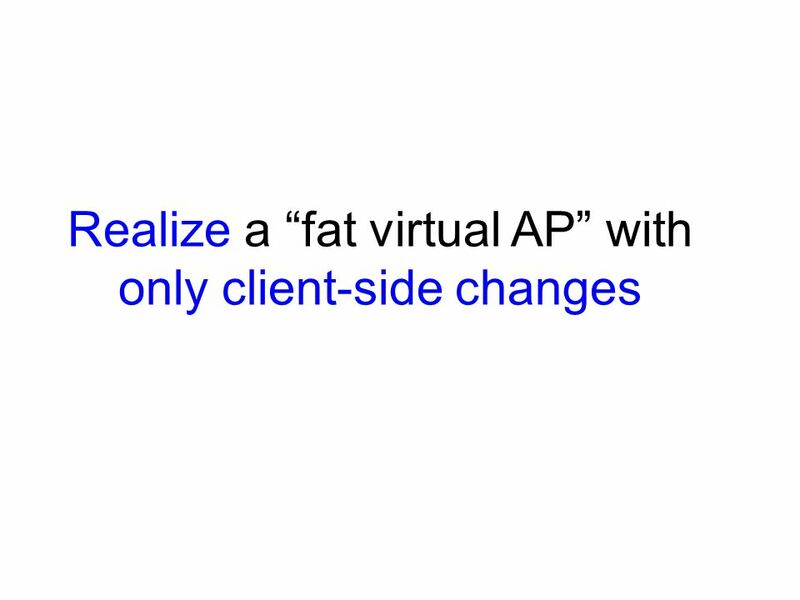 All Rights Reserved © Alcatel-Lucent 2009 Enhancing Dynamic Cloud-based Services using Network Virtualization F. Hao, T.V. 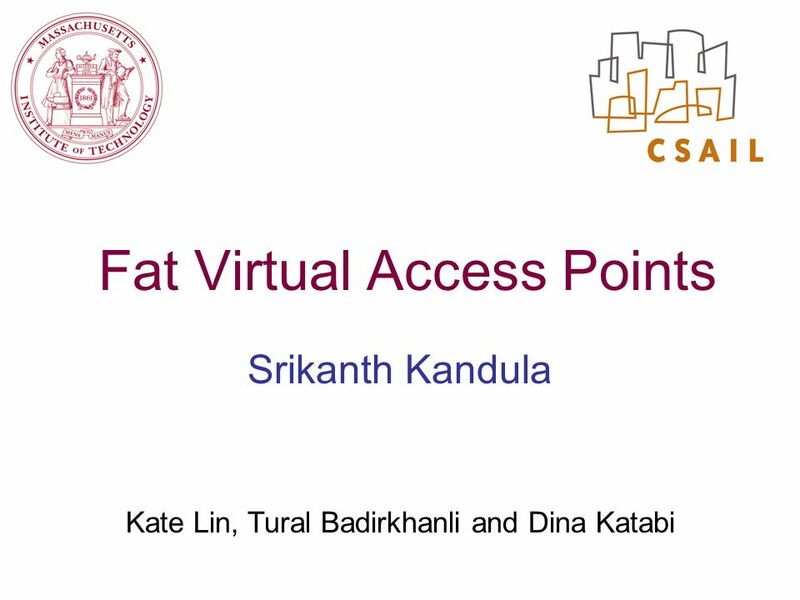 Lakshman, Sarit Mukherjee, H.
TCP Probe: A TCP with Built-in Path Capacity Estimation Anders Persson, Cesar Marcondes, Ling-Jyh Chen, Li Lao, M. Y. Sanadidi, Mario Gerla Computer Science. 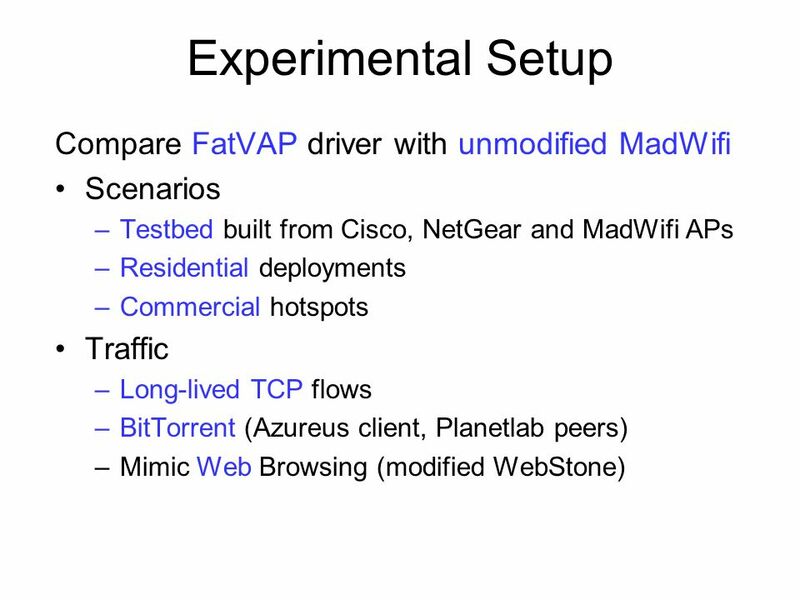 MultiNet: Connecting to Multiple IEEE 802.11 Networks Using a Single Radio Ranveer Chandra, Cornell University joint work with: Victor Bahl (MSR) and Pradeep.